Master Li made an appearance at the conference and spoke to practitioners for an hour and 40 minutes. 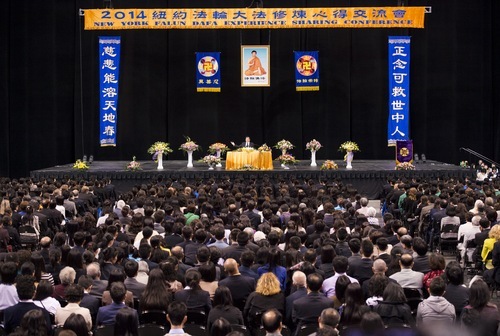 This year was the 18th New York Falun Dafa Experience Sharing Conference and the first time that a sharing conference was held on a weekday. The previous annual New York conferences have been held on weekends each year since March 23, 1997. 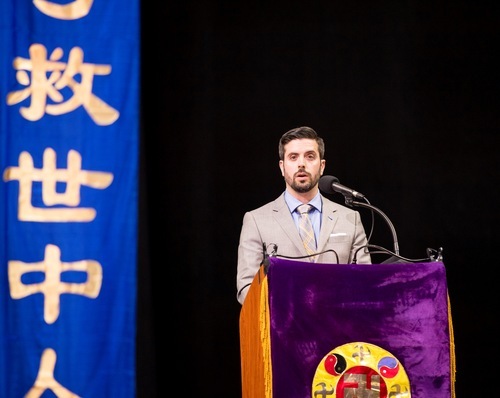 A conference and other public activities held during the week provides a better window for the public to witness Falun Dafa flourishing in the United States and around the world, despite the brutal persecution that continues in China. Previous New York conferences have been held in hotel conference halls. However, beginning last year, it moved to a sports arena. This year's Barclays Centre is a new facility equipped with state-of-the-art amenities. 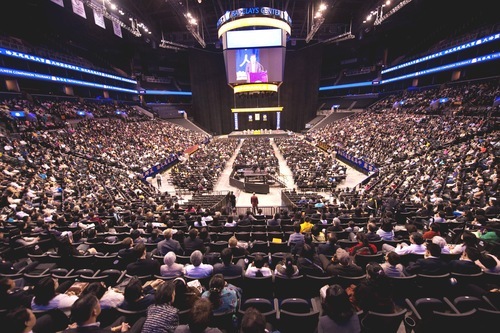 A massive multi-sided TV screen hanging in the center of the auditorium provided attendees with a clear picture of the stage. Electronic banners surrounding the venue scrolled various poems from Master's Hong Yin collection to encourage and inspire attendees. 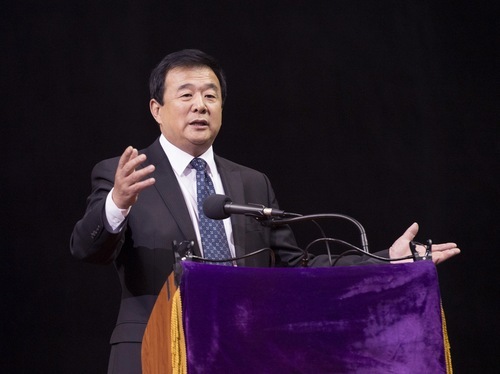 The crowd broke into enthusiastic applause upon the entrance of founder Master Li Hongzhi to the stage. Master Li lectured for about an hour and 40 minutes. 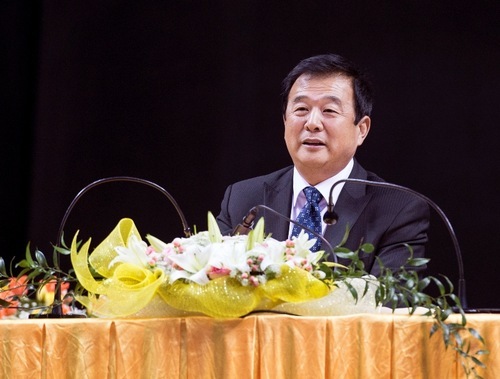 The conference began at 11 a.m. After the first sharing, Master Li Hongzhi entered the stage. The crowd stood up with respect and applauded enthusiastically. Master Li acknowledged practitioners' steadfast efforts in saving sentient beings. He also pointed out that practitioners in China and outside China have displayed a lot of human attachments and have become less diligent as the environment relaxes. Master's lecture guided practitioners to take cultivation seriously and cultivate diligently, as if one had just started cultivating. When the lecture ended, practitioners stood up again and saw Master Li off with warm applause, expressing their sincere gratitude. 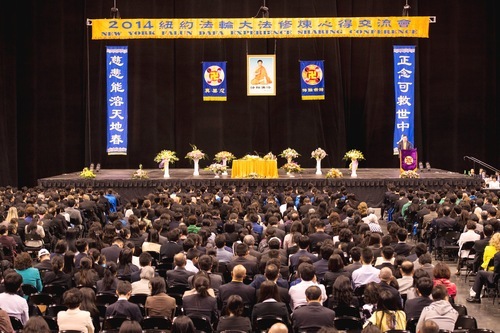 Many Western and Chinese Falun Dafa practitioners, especially those who have lived and worked in New York for many years, shared their stories of joining the practice, cherishing the cultivation opportunity, studying the Fa and tempering their xinxing, and striving to save sentient beings. 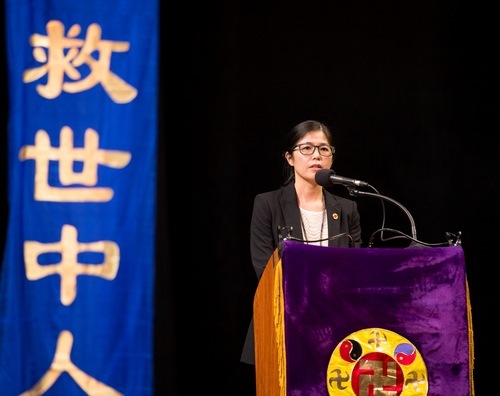 Ms. Li, a young practitioner from the Feitian Academy of Arts in New York, shared her story of clarifying the truth, promoting Shen Yun and helping Chinese exchange students quit Chinese communist organizations at her high school, which specializes in the arts. She started cultivation with her mother at the age of two and was separated from her mother at the age of five due to the persecution. She was finally reunited with her mother in New York and returned to cultivation 10 years ago, when she was 8 years old. Practitioners who spoke at the conference on May 13, 2014. Another New York practitioner, Ms. Lee, talked about how she went from mechanically following ordinary marketing methods to discovering a unique approach for Shen Yun promotions. She has been working at a prominent advertising agency in New York for many years. 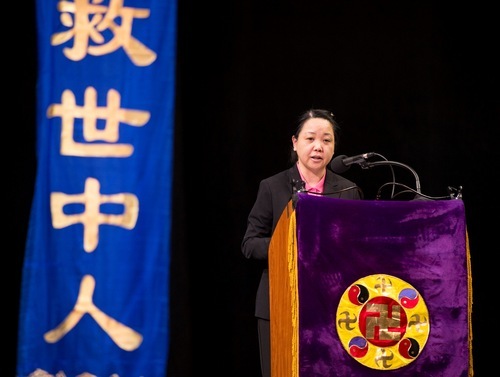 Through her work in promoting Shen Yun, she has lived the process of believing more in Master and the Fa, and achieving the realm of marrying professional skills with the higher principles of cultivation. A Western practitioner named Robert left a well-paying job in Washington DC and moved to New York last year to dedicate his efforts to the success of The Epoch Times. He is now a full-time art director for the newspaper. He encouraged fellow practitioners to cherish the opportunity and not to leave regrets in one's journey of cultivation. Falun Dafa has given 72-year-old Ms. Huang good health and she is full of energy. Even her vision was restored after taking up the practice. She is dedicated to informing Chinese people of the facts of the persecution and helping them quit the Chinese communist organizations. Every day, she carries a heavy dolly with truth-clarification materials from her home in New York's Chinatown to the Statue of Liberty, a must-see destination for Chinese tourists. 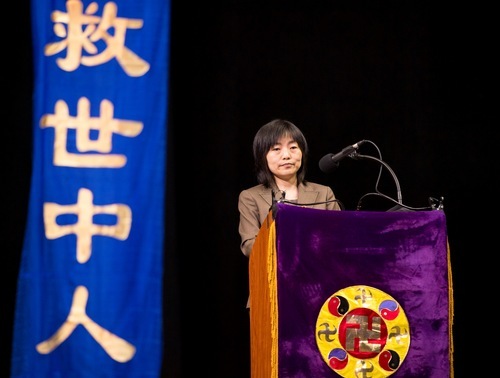 Another testimony to the healing power of Falun Dafa came from Ms. Yan from New York, who had a miraculous recovery after being hit by a bus. Facing this life and death test, she firmly believed in the Fa and recovered through intense Fa study and exercises. In order to help more Chinese understand the facts about Falun Dafa, she learned computer skills and even became a technician for other practitioners. She is a host of one of the teams that makes phone calls to China to inform Chinese people of the facts. Ms. Liu, a practitioner from Canada, shared how she had slacked off in doing the exercises and Fa study with the excuse of being too busy with efforts to save sentient beings. When she was awakened a while ago by Master's teachings encouraging practitioners to cultivate as if they have just started, she began persevering with her morning exercises and memorization of the Fa. She found that following Master's teachings and cultivating herself well was the best way to be more effective in saving sentient beings. Ms. Liu is a court interpreter for Chinese. She cherishes the opportunity to help her fellow Chinese and seizes the time to inform them of the facts, help them quit Chinese communist organizations, and promote Shen Yun. A practitioner from Taiwan, 67-year-old Ms. Xu, shared about the many conflicts she encountered when she didn't look inward and refused to listen to any suggestions while working on different projects. After she realized the problem, she corrected herself with cultivation and achieved good teamwork in her projects. She now coordinates efforts to make phone calls to China and clarifying the truth at tourist sites. Ms. Gong started her cultivation in 2013. She shared at the conference how she overcame fear and expanded her compassion while making phone calls to China to rescue incarcerated practitioners. Several other practitioners shared their experiences and insights at the conference throughout the day. The conference ended at 8:30 p.m.